When ever I want something quick and easy, I make Kung Poa chicken. I love the hot and spicy Szechuan flavors and have yet to find a Szechuan recipe that I don’t like. 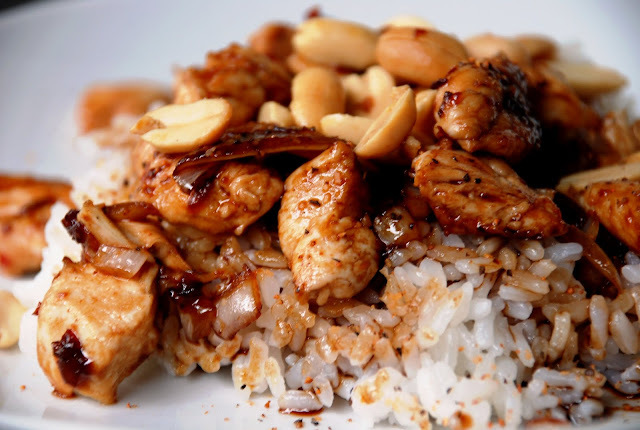 Originating in the Sichuan Province of southwestern China, Szechuan cooking is well-known for daring flavors, especially the spiciness and bite resulting from generous use of chili peppers and garlic, as well as the distinctive flavor of the Sichuan peppercorn, peanuts, sesame oil and ginger. I’ve modified and simplified this recipe. By cutting and preparing everything in advance using little prep bowls, I can cook this in a matter of minutes. Do not to overcook though as vegetables should still be crunchy. The Secret Ingredient: Sesame Oil. Adding just a few drops will give your recipe plenty of great seasoning. Combine chicken, salt, egg white, and cornstarch. Mix well by hand. Set aside. In small bowl, blend sauce ingredients. Set aside. Heat oil to 350 in a wok. Deep fry chicken until it separates and is almost cooked. Remove by draining through strainer into another pot. Reheat same oil. Deep fry peanuts over moderate heat until golden brown. Remove by draining through strainer. Reheat 2 tbs. oil in wok till smoking hot. Stir-fry red chili peppers till they are dark red. Lower heat. Add scallions and garlic. Stir-fry 30 seconds. Pour in chicken. Stir-fry on high for 1 minute. Add sauce. Stir-fry until heated and glazed thoroughly. Add peanuts.